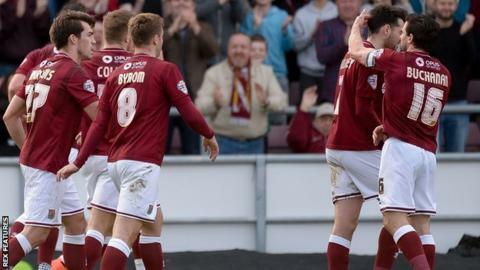 Northampton Town edged to victory over Newport County to continue their charge for promotion from League Two. John Marquis scored the winner midway through the first half, firing home after being teed up by Lee Martin. Medy Elito struck the crossbar as Newport pressed for an equaliser after the break but the Cobblers held on. Northampton remain 17 points clear of fourth but, with other results going against them on Friday, they will not be able to seal promotion on Monday. Victories for third-placed Bristol Rovers and fourth-placed Plymouth Argyle means Chris Wilder's side will have to wait until at least Saturday, 2 April to secure promotion to League One. Newport manager Warren Feeney told BBC Radio Wales: "I'm gutted for the players because I don't think you'll see another team come against the champions - they'll win the League easily - and outplay them like that, like we did. "I said to the players it's fine margins, we didn't track a runner for the goal - but apart from that I thought we had the best chances of the game. "It's about taking your chances and we didn't." Match ends, Northampton Town 1, Newport County 0. Second Half ends, Northampton Town 1, Newport County 0. Corner, Northampton Town. Conceded by Joe Day. Attempt blocked. Sam Hoskins (Northampton Town) left footed shot from outside the box is blocked. Attempt saved. Yan Klukowski (Newport County) left footed shot from the centre of the box is saved in the top centre of the goal. Substitution, Northampton Town. Danny Rose replaces Joel Byrom because of an injury. Corner, Newport County. Conceded by David Buchanan. Attempt saved. Mark Byrne (Newport County) right footed shot from outside the box is saved in the centre of the goal. Medy Elito (Newport County) hits the bar with a left footed shot from the centre of the box. Attempt saved. Sam Hoskins (Northampton Town) right footed shot from a difficult angle on the right is saved in the top right corner. Corner, Northampton Town. Conceded by Danny Holmes. Corner, Newport County. Conceded by Zander Diamond. Corner, Newport County. Conceded by Ricky Holmes. Substitution, Newport County. Yan Klukowski replaces John-Christophe Ayina. Attempt missed. John-Joe O'Toole (Northampton Town) header from the right side of the six yard box is close, but misses to the left following a corner. Corner, Northampton Town. Conceded by Scott Barrow. Substitution, Northampton Town. Sam Hoskins replaces James Collins. Attempt missed. Alex Rodman (Newport County) right footed shot from outside the box misses to the right. Danny Holmes (Newport County) wins a free kick on the left wing. Alex Rodman (Newport County) wins a free kick on the left wing. Attempt saved. John Marquis (Northampton Town) left footed shot from the left side of the six yard box is saved in the bottom left corner. Corner, Newport County. Conceded by Brendon Moloney. Substitution, Newport County. Scott Barrow replaces Andrew Hughes because of an injury. Attempt missed. James Collins (Northampton Town) header from the centre of the box is just a bit too high. Corner, Northampton Town. Conceded by Ben Davies. Second Half begins Northampton Town 1, Newport County 0.